*The Hometown Gallery will also be closed between December 29 and January 3 for the year-end, New Year holiday period. JR Himi Line: Disembark at Ecchu-Nakagawa Station and walk for 2 min. 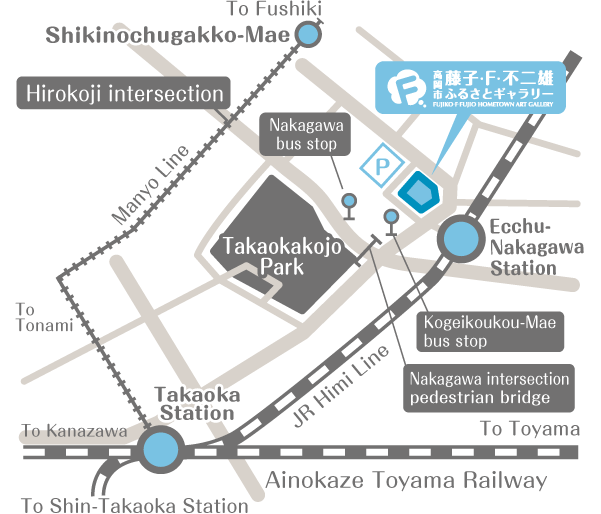 Manyo Line: Disembark at Shikinochugakko-Mae and walk for 10 min. Bus: Take a bus bound for Shokugyo anteijo-Mae, disembark at Kogeikoukou-Mae, and walk for 1 min. * Inquire with us if you wish to arrive by motor coach or other such vehicle.